​Pep Guardiola has apologised to Swansea City after dubious decisions enabled Manchester City to overcome the Championship outfit with a 3-2 victory in the FA Cup quarter finals on Saturday. Swansea stormed into a 2-0 lead at the Liberty Stadium before a late rally from City turned the tide. A wrongly-awarded penalty saw the visitors draw level, before Sergio Aguero headed the winner from an offside position. "If it's not a penalty, I'm sorry." "If it's offside, I'm sorry." "VAR is not here, I don't like it." 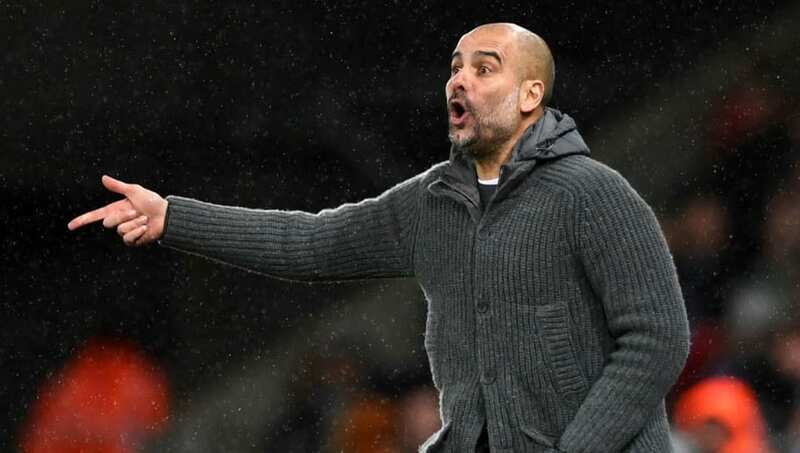 Guardiola praised his side's battling qualities after the game, but also admitted that the absence of VAR cameras was a factor in Man City's goals. As quoted by The Sun, the City boss said: "If it was not a penalty and if our third goal was offside, then I am sorry. "But you have to ask the authorities why VAR is not here today. We asked for it at the start of the season but we haven't got it. They have it all around Europe but here they have it in some games and not in others and you have to ask why that is the case. "I don't like to lose when the decisions are wrong and the referees must be helped. It's better to take three minutes to get the decision right than ask the referee to make an instant decision. "But if you look at this game you will see that we played incredibly well. The amount of actions, crosses and shots and had - we deserved to win this game by far." Guardiola also admitted he is concerned by the prospect of future problems with pitch invaders after a fan ran onto the pitch during Manchester City's clash with Swansea on Saturday. The supporter was involved in an incident with City star Oleksandr Zinchenko during the FA Cup quarter final clash at the Liberty Stadium. As reported by ​Sky Sports, three individuals were arrested and held in custody by police after two separate incidents had occurred during the game, apparently involving two ​Swansea fans and one ​Man ​City fan. Guardiola admitted after the game: "It's happened a few times lately and it's a worry because in the future we could have problems. "It's not nice but thankfully nothing happened this time." A statement from South Wales Police match commander Superintendent Steve Jones read: "The safety of supporters, players, officials and those who work these games is paramount. "Those who invade the playing area are committing a criminal offence, will be dealt with robustly and could face lengthy bans from all football matches. "We will continue to work with the football club to prevent and deter this unacceptable behaviour from a very small minority continuing." Issues with supporters invading the field of play have increased in recent weeks. Seven people were also arrested during ​Bournemouth's 2-2 draw with Newcastle on Saturday, after visiting supporters entered the pitch to celebrate Matt Ritchie's late equaliser for ​Newcastle. The most recent events came just a week after ​Birmingham supporter Paul Mitchell was jailed for entering the field at St. Andrew's before punching ​Aston Villa captain Jack Grealish during the visitors' 1-0 victory in the Championship.